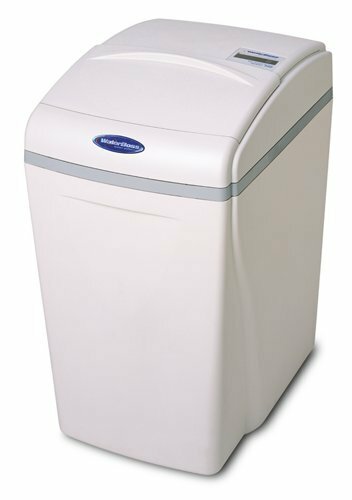 The WaterBoss 220 is a water softener designed for small capacity homes up to four people within urban areas. This water softener will soften about 70 grains per gallon while reducing the amount of iron and chlorine within the water. Its compact design allows for easy installation for the average consumer within a small space. One of the main benefits of this water softener, comparatively to other water softeners on the market, is its ease to upkeep. This filter only requires about 2.5 lbs. of salt in order to regenerate, and only takes about 20 minutes to complete. This quick process allows the filter to use less water than other filters to accomplish the same tasks. Comes with a sediment filter, resin tank, and brine tank built into the unit. Dimensions: 18.8 x 14.8 x 35.8 in. The size of the softener is 22,000 grain. Designed for homes that resides within urban areas have four people or less. Provides water flow without significant pressure drop to smaller homes within urban areas. By-pass valve extends the life of the filter. only uses 14 gallons of water and about 20 minutes to complete. Overall, consumer feedback is positive for this product, and this system has received a very high rating from those who have tried it out after receiving it. Consumers who give this product the highest reviews were those who experience easy installation and are happy with the amount of salt the water softener requires to function. Other consumers who give this water softener high reviews are those who needed to contact WaterBoss’ customer support for either a defective part or for assistance with installation. These consumers were very happy with the service they were provided. Consumers who gave the product low ratings did so because they had issues with customer service replacing parts within their warranties. It seems that if damaged parts or confusion arises during the initial installation of the water filter, WaterBoss’ customer support is more than happy to help solve the problem and replace the needed parts. If issues are not discovered within the initial installation of the system, consumers are left to rely on their limited warranties to replace parts or fix damages. Based on the reviews, consumers that need to use their warranty to help fix problems are left feeling dissatisfied. What consumers like most about this water filter is its compact nature and ease of use. Consumers like that this water filter does not require a lot of salt to function, and that the salt is easy to add to the system. The size of the system is a huge benefit to consumers with small households because it can be placed in the smaller spaces that urban homes typically have. It is also easier to install than larger systems because the brine and resin tanks are within the system, which leads to less plumbing equipment required to connect the parts. Easy to use because of its compact nature. The small dimensions of this filter are a real space saver for those who don’t have a lot of room in their homes for filtration or plumbing. This system combines the brine and resin tank within the unit, allowing the overall size of the filter to stay quite small. This is different from other filters that offer brine and resin tanks as attachments to the outside of the filter. Because of the size of the unit, it uses less salt than other units while still effectively softening water. The salt is also easy to add to the system. Simply slide open the door and add salt. Timely and efficient customer support from WaterBoss. Most consumers say that installation is simple comparatively to other units that require a plumber to install. The accompanied instructions were easy to understand. Unlike other water filters, this one combines the brine and resin tanks within the unit, which may seem confusing or difficult to consumers used to a larger water filtration system. Some consumers receive defective units by mail. The salt storage and controls for the system share the same cover, which can expose the controls to possible corrosion. The filter comes with a 3 year limited warranty, and the media tank and outer cabinet come with a 10 year limited warranty. Comparable water filtration systems come with better warranties.